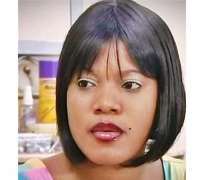 Star yoruba actress Toyin Aimaku has met her waterloo due to her philandering ways. Her Pastor father has disowned her . according to sources close to the family they say she has been a constant embarrassment to her father's congregation who look up to her father for spiritual guidance. Toyin in the mean time does not seem to be bothered about the turn of events as she retorts she likes when men give her attention and that is just her person.